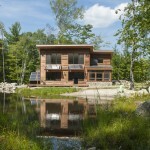 Quality over quantity; a small sun-filled home poised on a delightful site in western Maine goes ‘Net Zero’. Briburn was approached to create a small, affordable, one-two person home with the ability to go off the grid as needed or as desired. This meant that the home had to be highly durable, resilient, and energy efficient, even “Net Zero” (able to produce as much energy as it consumes). 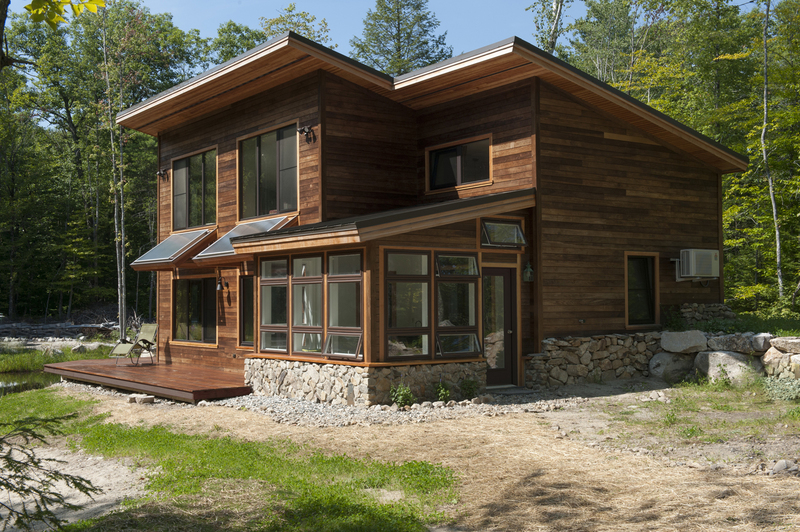 This was achieved by taking advantage of passive solar design principals, super-insulating the home with a vapor-open, truss-stud construction method, and by using highly efficient European triple pane windows. With the energy demand reduced, the mechanical system could be downsized to a single affordable ductless mini-split heat pump system. 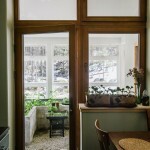 The home also features an attached greenhouse for year-round gardening. This home is located on a brand new upland pond in Parsonsfield, Maine. 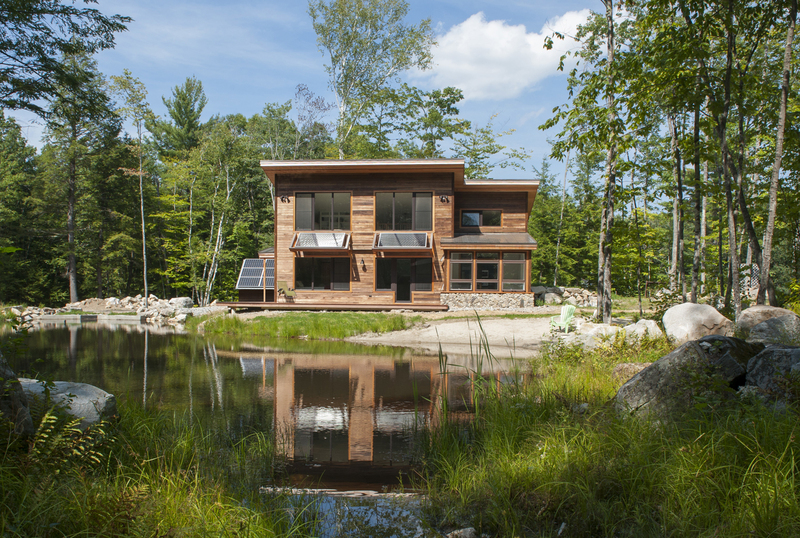 The pond was first conceived and permitted for micro-hydro electrical production and it will fill that role for this home once the equipment is in place and goes online. The home presently has a solar shed that houses the battery array, meter, and inverter. In the very near future, a covered bridge will be built that will support an even larger solar array. The sun shades over the ample southern windows are themselves solar hot water panels. As with many projects, the budget was very tight. This meant every design decision had to take into account its long and short-term economic effect. To the owner’s credit, almost nothing was sacrificed when it came to energy efficiency and construction quality. 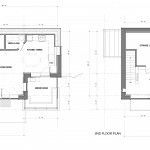 The home is small with an interior that is extremely simple, and open. It is detailed with stained concrete floors, deep window sills and jambs, and hand painted cabinets. 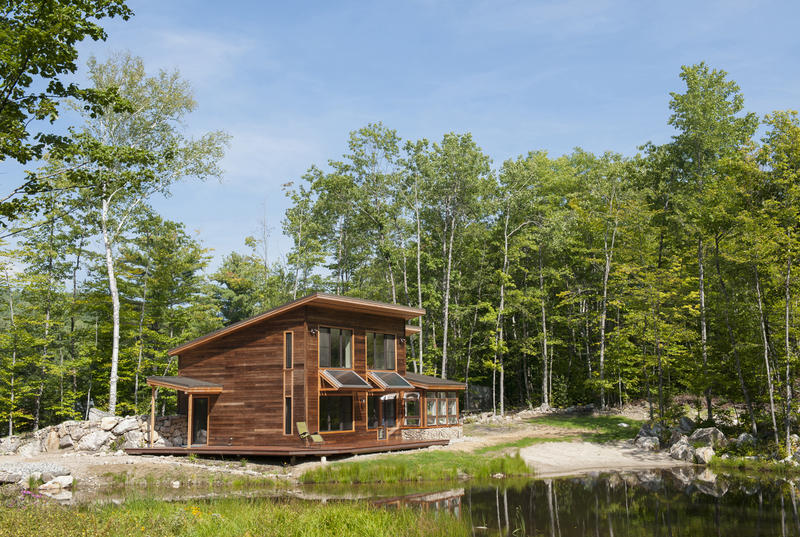 On the exterior, the home is clad with thermally modified local poplar, douglas fir trim elements, metal roof and masonry that was completed by the homeowners with stone salvaged from the property. Solar hot water system provides the majority of the owner’s domestic hot water. Solar hot water panels are used as shading devices for the southern windows. Sunny Island Inverter to allow fluid transition from DC to AC and from Home to Grid as the home and batteries need. 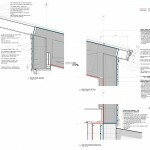 Vapor-open wall and roof assemblies. Frost protected 10” thick polished concrete slab provides substantial thermal mass. Triple pane European tilt-turn windows (u=0.088, SHGC=0.5) create tightly sealed, well insulated portals for natural daylight and solar energy. 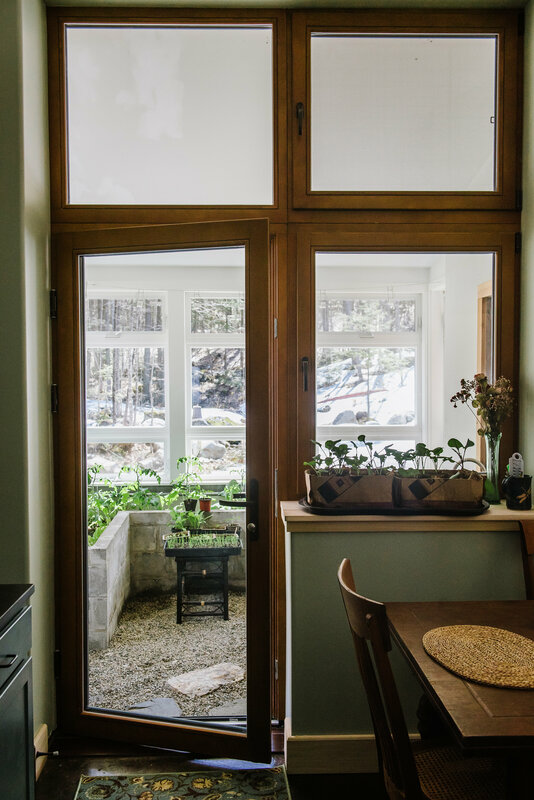 Passive solar design (orientation, fenestration, thermal mass, and shading) provide the primary means of thermal comfort and financial efficacy. High efficeincy ERV was installed to ensure a high level of indoor air quality while maintaining energy efficiency. Performance Tested by RESNET Rater. The home has been off the grid for the past year. The home is clad in stone, torrified poplar, and a metal roof. The home takes adavantage of a natural elevated spring. A pond was created (already teeming with wildlife) that will not only provide a scenic and tranquil sense of place, but will be generating year-round power after the installation of a micro-hydro generator. The circle is complete with this home. Water is from a well on site. Septic is treated on site (septic leach field). Power is generated on site. Food is grown on site in the 4 season green house. The trim was milled from trees harvested on site. Stone was harvested from the excavation of the home. Passive Solar Design: Oriented on an east-west axis to maximize solar exposure and is liberally fenestrated on its southern side to take advantage of the sun’s daily energy offerings. The generous roof overhangs and a brise soleil were designed to block the high-angle summer sun while allowing lower-angled winter sun deep into the building. 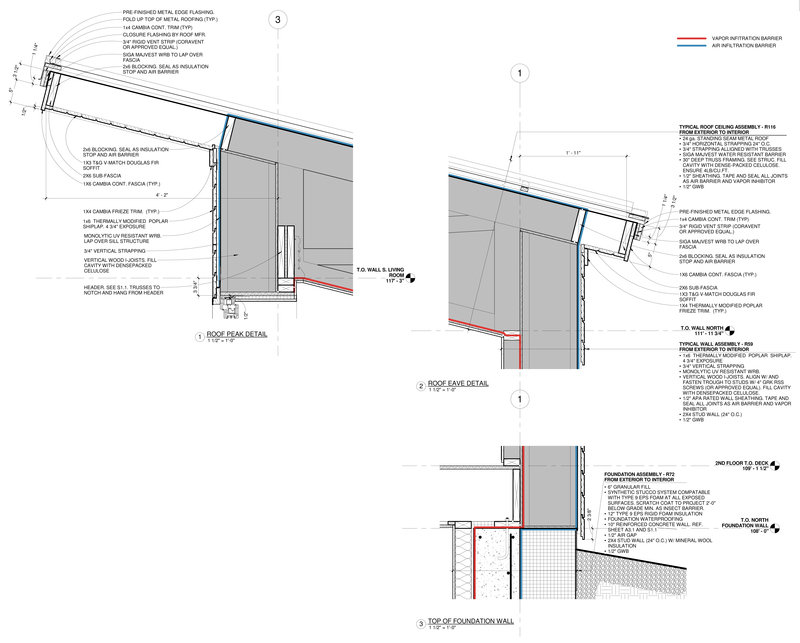 The exterior envelope is substantially insulated (Slab R-60, Walls R-58, North Foundation Wall R-72, Roof R-115) and sealed to protect the interior from the bitter cold of our region’s harsh winters. 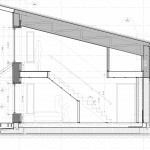 The home is sheltered on the north end by being built into the small hill that exists on site. 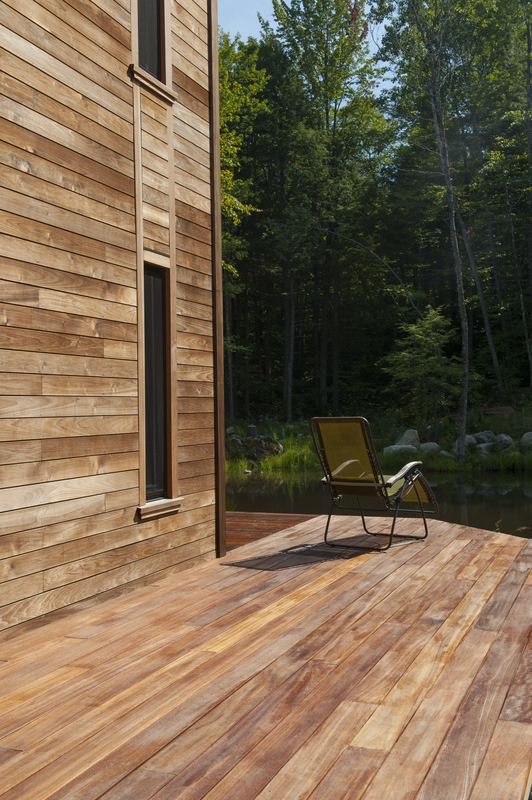 This improves its energy profile and protects it from Maine’s harshest winter storms. 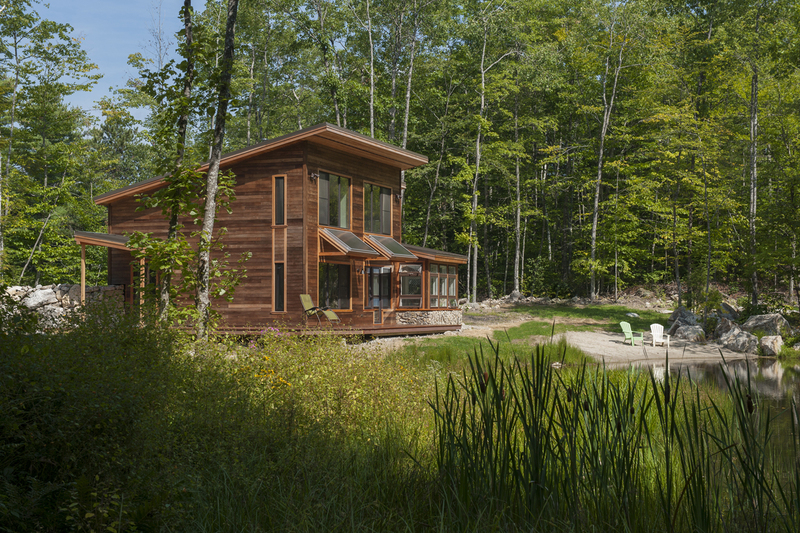 The home will soon have a micro hydro generator, taking advantage of the elevated pond on site. 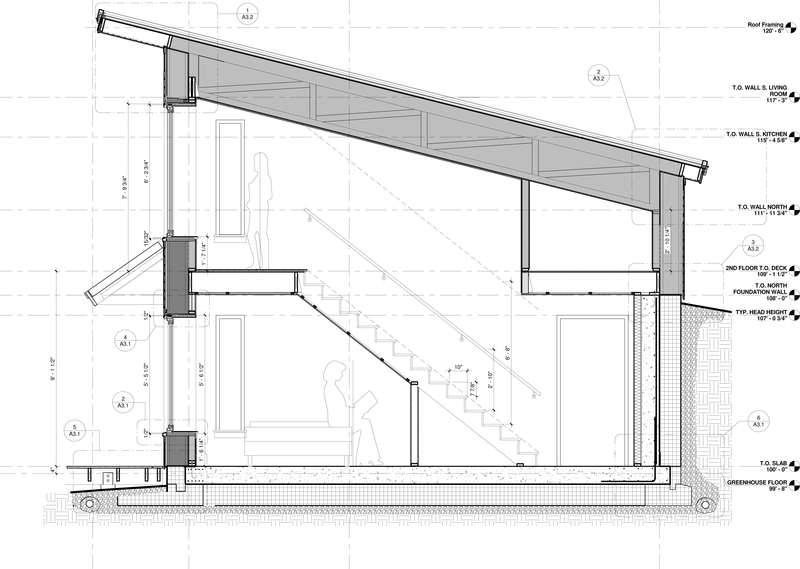 Passive solar design. It is not only good for energy performance but for natural daylighting. Large European triple pane windows fill all the living spaces with ample natural daylight and allow the home to be well lit with only natural daylight even on the cloudiest of days. Most windows are operable and allow providing natural ventilation whenever the exterior environment is pleasing. 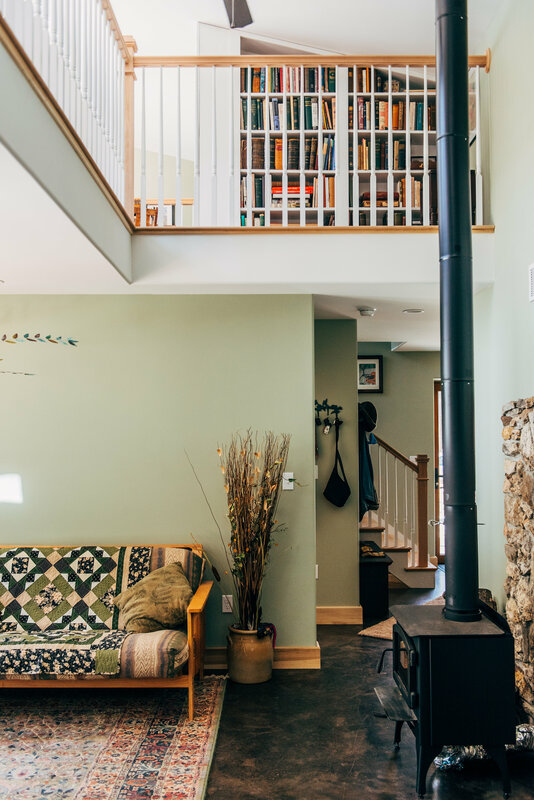 An ERV constantly and efficiently provides fresh air for the home (roughly .3 air changes an hour) and monitors the supply and exhaust air’s humidity and temperature and continually balances their exchange within its core to optimize performance. The ERV is outfitted with MERV 13 air filters. Plumbing fixtures are Water Sense labeled. 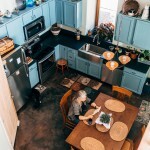 The home has been off the grid for over a year with very little sacrifice to everyday conveniences. 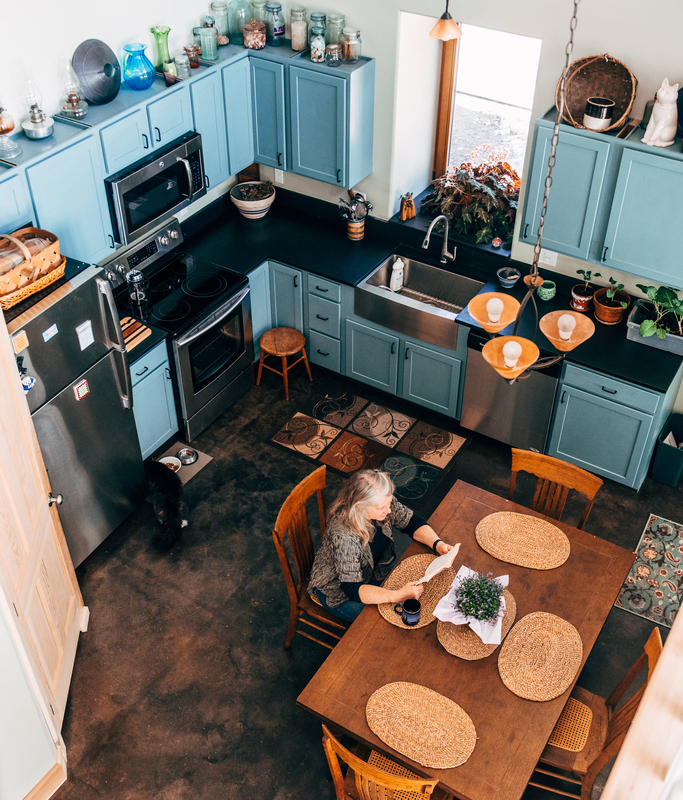 The vapor open assemblies and highly durable, low-maintenance finishes ensure that the home will be a blessing rather than a burden to future occupants and owners. A low-energy, balanced ventilation system provides continuous fresh air with a high energy recovery rate. The home is fossil fuel free. 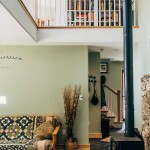 The home is carbon neutral (provided that the logs burned in the wood stove continue to be sustainably harvested. 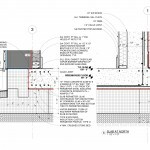 Frost protected slab construction: Minimizes site disturbance, saves money on concrete and excavation and puts that money toward insulation/formwork. Slab insulation/formwork is manufactured offsite, dramatically reducing waste (waste product gets immediately recycled and reused). They are cut from Type IX EPS polystyrene based on the Architect’s CAD files. They are assembled in place and also become the form work for the slab. Vapor-Open Larsen Truss walls: The walls are first constructed as simple 2×4 stud walls with Zip System sheathing. The sheathing becomes both the primary air sealing layer and the vapor control layer (class II vapor retarder). Then 11 7/8” wood I-joists are fastened on the outside vertically and wrapped with a WRB that acts as the building’s secondary air control layer. The I joist cavity is filled with dense-packed cellulose (high recycled content, low embodied energy, low global warming impact, low emittance). Then a ventilation rain screen is installed followed by siding. Vapor-Open Roof Assembly: Mono Pitch 23” Deep Roof Trusses. Sheathing at bottom of trusses allowed the building to be pressure tested after insulation with the air control layer completely exposed so that any air leaks can be easily found and sealed. The Truss cavity is sheathed again and wrapped in a SIGA WRB (chosen for its strength and permeability) then completely filled with dense packed cellulose then. 3/4″ strapping alligned with the trusses below create a ventilation space for the roof. This is followed by a standing seam metal roof. Sheathing layers are on the warm side of the assembly eliminating the risk of condensation and mildew for the life of the building. Dense packed cellulose was selected because the choice of insulation with a minimal (and easily recovered) global warming impact was paramount. The stained concrete 1st floor eliminates the need for more an additional flooring material. Simplicity of design, especially form, kept the cost in check. Excluding some trades exeuted by the clients themselves (sitework, masonry, salvaged materials) the construction cost for the building was only $189 per square foot! 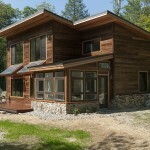 Thereby meeting the owner’s goals of affordably and comfortably living off the grid. There is ample room to expand to the west however it is hoped that those who would inherit such a building will have already adopted the “less is more” appreciation and attitude that the current owner possesses. Its highly durable assemblies and finishes will provide a high level of performance well into the future and represent an investment in the next generation who will inherit the building and its design. The owners have invested in renewables and off-the-grid infrastructure to the benefit of future owners of the home. The home is Energy Star certified which includes a REM Rate energy model as well as testing and verification of the completed home. The owners have been, and continue to be highly involved in the home’s systems performance, installation, and maintenance and exhibit a very high level of knowledge about residential energy efficient systems.